Whether you're going to a Halloween party, throwing one or will be passing out candy to the neighborhood kiddies you're going to need some sustenance. 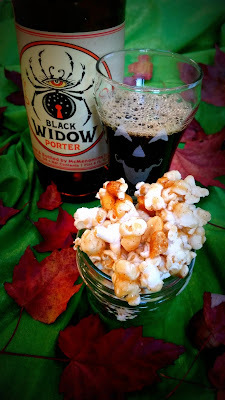 Give that sustenance a festive twist by pairing McMenamins Black Widow Porter with a grown up version of caramel corn. Sweet and salty with just a touch of heat it pairs beautifully with robust roastiness of Black Widow. Pop popcorn in air popper (or alternative desired method). While popcorn is popping, rough chop peanuts. When done mix popcorn and peanuts in one very large bowl or split between two bowls. Combine remaining ingredients in a small saucepan; bring to a boil. Cook 1 minute, stirring constantly, making sure to break up any clumps of sugar or spices. Remove from heat; cool 1 minute. Pour hot syrup mixture over popcorn mixture; toss well to coat. Immediately spread popcorn mixture out into prepared jelly-roll pan. Cool completely. Cooled mix may be stored in an airtight container for up to two days. A week ago I was stoked for the Willamette Week's Beer Pro/Am. This week has me already excited for next year's event and here's why. 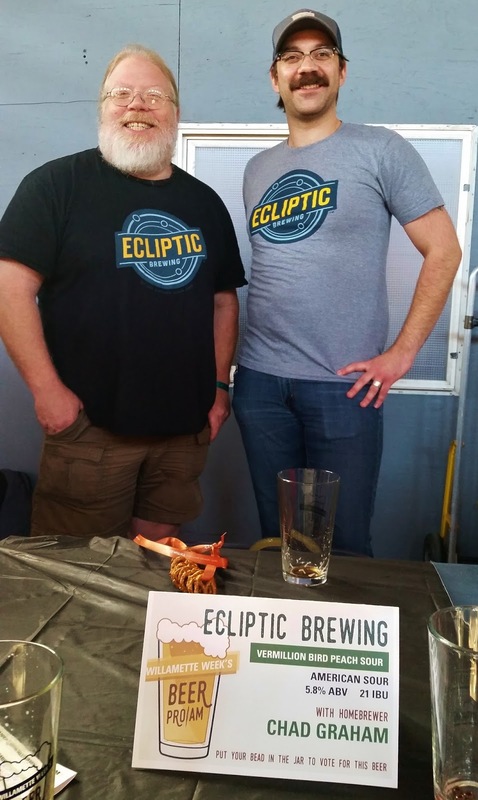 The biggest reason is that this is one of the few, possibly the only, beer festival in town where you'll be able to talk to each and every brewer and they'll be pouring the beer. I'm not talking about just the amateurs. I'm talking about the professionals, too. 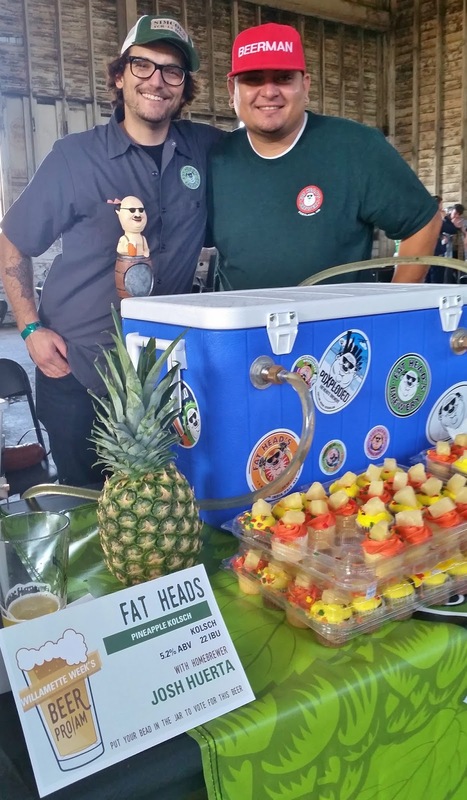 Most festivals utilize volunteer pourers, many of which who have never tasted the beer they're pouring and I consider it a huge disservice to the beer and the brewer/brewery that made it. A very close second reason is that this is a huge opportunity for both amateurs and professionals. On the amateurs' end, they collaborate with a professional and brew on a commercial system, things even well-seasoned homebrewers can appreciate. On the professionals' end this is a way to stay connected to the homebrewing and craft beer drinking community in a way that is increasingly difficult yet important to the heart of craft beer. Beyond that the beers made for the festival rank right up there in creativity with those of the Fruit Beer Festival and tend to reflect the signature style of the brewers. For example, Capsaison from Upright Brewing and Ritch Marvin, was a barrel fermented saison with chili peppers. Saisons are in Upright's wheelhouse and anyone that knows Ritch knows his thing for growing and using chili peppers. This year marked the third year of the festival and it's grown by leaps and bounds. Starting out in the Con-Way Warehouse in NW with a mere 12 Pro/Am pairs, last year it moved to Zarr Studios in SE where it filled the space to its gills and this year, now with 21 Pro/Am pairs, expanded to the former Metalcraft Fabrication location, now called The North Warehouse, just down the hill from Widmer. The space easily accommodated the event and I'm hopeful that it will be utilized next year. Regardless where it's held you can bet I'll be there to see what the Pro/Am pairs have brewed up. A few weeks ago a buddy of mine heard a rumor that George Washington had included "growlers" in the list of supplies for his troops. Wanting to find out if there was any truth to this he wrote to the VP of Historic Preservation and Collections at Mount Vernon. Being good folks that they are, they delivered to him a 10-page document relating to George Washington and beer. Alas, there does not seem to be any documentation of him ordering growlers but there were some interesting bits included in the document. Thanks to my friend, Leafy, for passing this on to me and huge thanks to the Mount Vernon staff for pulling it together. That concludes today's history lesson. Now get to happy hour and impress your friends with your new-found knowledge. 4 Ledger A, 2/1/1755, 19a; Orders & Invoices, 8/1757, 9/1760, 4/1763, and 9/1765; George Washington to Robert Cary and Company, 7/15/1772, The Writings of George Washington, 3:92.